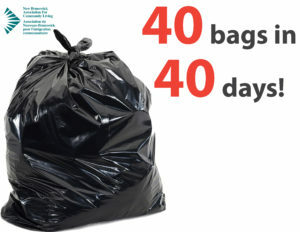 Home > In the News > 40 bags in 40 days! 40 bags in 40 days! Do you observe Lent? If so, instead of giving up sweets, how about giving up clutter! Each day of Lent, fill a bag (any size) with clothing and cloth items you no longer need/use and donate them to the New Brunswick Association for Community Living’s Community Collection program. NBACL will use your donation to generate funding for much-needed supports for New Brunswickers who have an intellectual disability, and their families. or arrange a pick-up by calling 1-866-NBACL4U (1-866-622-2548).